on the popular NBC television quiz show of the 50's "You Bet Your Life." George Fenneman, who earned an enduring place in television history as the good-natured, courtly foil to the tart-tongued mischief of Groucho Marx on the long-running quiz show "You Bet Your Life," died May 29 at his home in Los Angeles. He was 77. He died of emphysema, said his wife, Peggy. On "You Bet Your Life," which was heard for three years on radio before beginning an 11-year run on NBC television in 1950 followed by a long afterlife in reruns, Fenneman was announcer, on-air bookkeeper and resilient second banana. Once, a young female contestant referred to Fenneman as Fidderman. Marx promptly summoned the announcer onstage and in an onslaught of wild humor accused him of leading a double life. There was also the time when Fenneman, suspended in a harness, was enlisted to substitute for the scruffy stuffed duck that dropped from overhead with a $100 payoff in its beak when a contestant said the magic word the audience was privy to from the start of each show. "Everyone had told Groucho 47 times before the show, 'Don't touch him,' " Mrs. Fenneman said. "So George came down, and Groucho immediately came over and pushed him; and he turned upside down. He was absolutely terrified." Frank Ferrante, who portrayed Marx onstage in New York and London in "Groucho: A Life in Revue," recalled Marx's assessment of Fenneman. "Groucho called him the male Margaret Dumont," Ferrante said, referring to the grande dame whose hauteur was the constant target of comic darts in Marx Brothers films. "George took it as the highest praise. 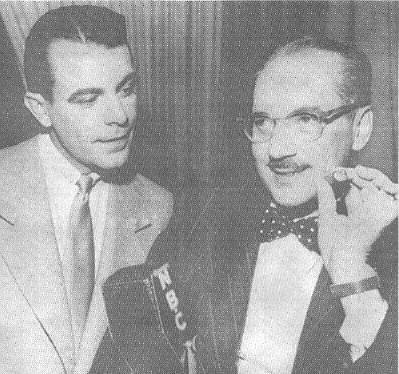 Groucho called him the perfect straight man." Although "You Bet Your Life" was a quiz show, the chance to win up to $1,000 was secondary to Marx's jokes. He asked a young woman why she wasn't married. "I'm waiting for Mr. Right," she said. "Wilbur or Orville?" he asked. A man with a thick accent claimed he spoke eight languages. "Which have you been speaking so far?" Groucho asked. Long before Fenneman actually met the stogie-puffing, bow-tied, impudent Marx, he was a fan. As a student at San Francisco State College he was a frequent visitor to the Golden Gate Theater. Often his date was another aspiring teacher, Peggy Clifford, whom he married in 1943. The attraction at the Golden Gate was the Marx Brothers, rehearsing future movies like "A Night at the Opera" and "A Day at the Races" to get the comic timing down pat. "He would sit there and laugh, watching show after show," Mrs. Fenneman said. "For him, to work with Groucho was a dream." The dream came true almost by chance. Fenneman, who always had an interest in radio, found work with a San Francisco station after graduation from college. Not long afterward, Robert Dwan, a program director, hired Fenneman for another station in San Francisco. "He had a naturally good voice," he said. Before long, both the Fennemans and Dwan moved to Los Angeles. One day, on a lunch break from his announcing duties at KGO, Fenneman encountered Dwan at Hollywood and Vine. Dwan told him to hurry over to a studio where auditions were being held for a new Groucho Marx program. Dwan, who became the program's director, said Fenneman's clean-cut looks, mellifluous voice and splendid chemistry with Marx were not the real reasons why he was hired for the job, which paid $55 a week at the start. "We hired him because he was very bright," Dwan said. The format of the show gave the contestants $100 to bet. "Part of his job was to keep track of the amounts of the money the contestants had in the quiz. It was slightly complicated, because they could bet any amount they wanted. Groucho had a tendency to get them to bet odd amounts, like $17.36. So George had a bit of a task." While announcing for "You Bet Your Life," Fenneman was also heard on the popular television series "Dragnet," in which he intoned, "The names have been changed to protect the innocent." He appeared in the 1951 film "The Thing," did commercials for companies like Philip Morris and Lipton Tea, was the television spokesman from 1978 to 1995 for Home Savings of America and had such shows of his own as "On Campus" and "Talk About Pictures." Fenneman, an only child, was born Nov. 10, 1919, in Beijing, where his father, Edgar, was an accountant for an import-export company and his mother, Jessico, was the minister of a church she called the Divine Art of Living. When George was 9 months old, the Fennemans moved to San Francisco, where he grew up. In addition to his wife of 54 years, Fenneman is survived by three children: Clifford, of Van Nuys, Calif.; Beverly, of Torrance, Calif., and Georgia Cole of Fort Collins, Colo.
Fenneman and the irrepressible Groucho remained friends until Marx died at 87 in 1977. On a visit toward the end, Ferrante recalled Thursday, the time came to return the frail comedian to his bed. Fenneman lifted Groucho from his wheelchair, put his arms around his torso and began to shimmy him across the floor. As he did, he could hear a voice rasping in his ear. "Fenneman," Groucho said, "you always were a lousy dancer." Thanks to Jonathan Jacobs for forwarding this article. LOS ANGELES (AP) -- George Fenneman, whose deferential mannerprovided a counterpoint to the wise-cracking Groucho Marx on the television quiz show "You BetYour Life,'' has died, his wife said. He was 77. Fenneman died May 29 at his Los Angeles home of emphysema, his wife,Peggy, said Wednesday. "He had a long and wonderful entertainment career,'' she said. Still, Fenneman was funny because Groucho was funny. At one point in the show, a prop duck lowered on very visible piano wire when Groucho uttered the key quiz show phrase, "What's the secret word?'' The duck had the answer. His voice work on the archetypal cop drama resulted from a friendship with the show's creator, Jack Webb. As recently as 1993, he performed the "Dragnet'' voice on "The Simpsons,'' according to Frank Ferrante, an actor who played the role of Groucho Marx on stage in New York and London. Fenneman remained friends with Marx until the comedian's death in 1977, Ferrante said. Fenneman, raised in San Francisco, was born in Beijing, China, on Nov. 10, 1919. Fenneman was the announcer for the show beginning in 1950. The show began on radio in 1947 and went on television in 1950. It lasted until 1961. Fenneman was cremated. He is survived by his wife and three children.